Topics such as creation, the fall of man, servanthood, holiness, and more will be etched into readers’ hearts and minds through this devotional. 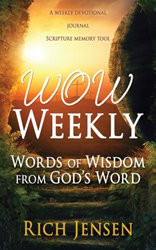 Within the pages of Rich Jensen’s book, WOW Weekly: Words of Wisdom From God’s Word ($14.49, paperback, 9781498479554; $6.99, e-book, 9781498479561), readers will find a year-long devotional that will reveal God’s truth throughout the Bible. Each of the weekly devotionals consist of a primary verse or passage of discussion, followed by set questions to prompt journaling opportunities, and suggested verses to commit to memory. Beginning with the first verse in the Bible, Genesis 1:1, speaking of creation, Jensen takes readers through the Bible, each week hitting on topics the Bible stresses, such as rest, Jesus’ death on the cross, thanksgiving, and more. Jensen also offers personal insight to help better explain these verses and topics, while offering relatable stories and truths. “Cementing His Word in our minds and hearts is our goal … that has prompted the extra effort of this devotional to have opportunity for reflection and memorization of His truths,” said Jensen. Xulon Press, a division of Salem Media Group, is the world’s largest Christian self-publisher, with more than 12,000 titles published to date. WOW Weekly: Words of Wisdom From God’s Word is available online through xulonpress.com/bookstore, amazon.com, and barnesandnoble.com.